Have you ever felt that you were way over your head? I have–many times. My first large speaking engagement was back in the ‘90s. Why I said yes was beyond me. I had never stood up in front of more than a handful of women at my Bible study or our church’s women’s retreat. Even then, I didn’t have to use a microphone. And now, five hundred expectant women were going to be staring me in the face. To top it all off, the theme was Unshakable Confidence in Christ. Laughable. I never mentioned to the ladies that I was going to be the speaker for their next women’s night out because, at that moment, I wasn’t so sure I would be. I have no idea what Mary Marshal said in her devotion. All I wanted to do was grab my Walmart purse and escape the scene. Heavenly Father, sometimes I listen to the devil. I know I shouldn’t, but when he tells me I’m not good enough, my heart wavers. Help me to defeat the devil’s lies with Your truth. Help me to live bold and believe that I am who You say that I am. In Jesus’ Name, Amen. What is one lie that you are going to replace with truth this year? Ever feel that you’re just not enough? 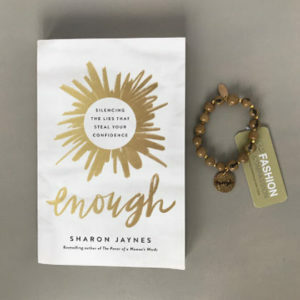 2019 is the year to get rid of that lie once and for all with my latest book, Enough, Silencing the Lies that Steal your Confidence! Learn how to recognize the lies, reject the lies, and replace the lies with truth. Don’t let the enemy hold you back for one more minute! Also, check out the laminated Identity in Christ card to remind yourself everyday who you really are! Oh wow! I can relate to this. These past couple of years Iv been trying to figure out what I’m supposed to do with the suffering Iv had in my life. It’s not been fun but I know I have been touched by Jesus. He has been my Rock, rescuer, redeemer, and rest. now I want to show others they can not survive but thrive! not that I’m special but because I’m relatable, I’m opening my home to ladies who need a safe place to share, talk, cry, encourage each other, pray and just try to keep preserving in this life. I need this for myself. Satan makes me doubt myself by saying to me, is this really what the Lord said? You’re not equipped enough, not well enough, strong enough, so who are you to offer consolation? But I’m going to move forth with This despite my doubts. “God is within her, she will not fall”; psalms 46:5 this is my prayer. Thank you for today’s post. I needed this! Thank you for sharing this message. 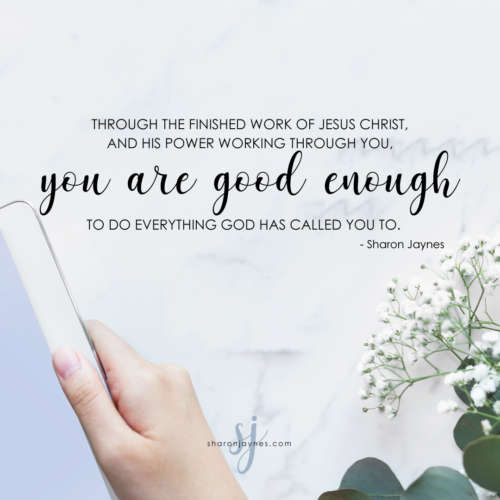 Satan has been messing with my mind big time, especially since I have begun to dig into God’s word and have begun asking Him to show me my purpose and lead me to do His bidding. Since I purposed to read through the Bible this year, Satan has me questioning ALL the events, questioning God’s idea of fairness and the morality of Abraham, Issiac, Jacob, and Lot. I don’t want to question. I want to BELIEVE with all my being. What a powerful message! I am always doubting myself and hearing that I am not good enough. Through Christ I will overcome that false message. I needed that today. I do surface pattern design for a print-of-demand company and it is a fact that I am surrounded by more talented designers. But in the last 30 days my biggest seller was a 9 year old design that might have sold once before. If my old design is good enough to sell, the newer ones should, too. Thank you for your sharing. I needed to hear that. God bless your ministry. Thank you for sharing this touching story. Recently, my husband and I stood in faith for our grown son’s healing from colon cancer. I even asked the doctor what he would do when he found no cancer. His answer just about blew me out of my seat and my composure! Oh I will, it is there! I felt it. Well he did find the cancer. My world came crashing down as my husband and I came to terms with an outcome we didn’t expect. Spiritually, I crashed and burned! I cried out to God that this wasn’t the outcome I had believed and prayed for. So i began to question my motives. Did I ask amiss? Was there sin in my life that hindered the answer and then when I finally quit looking for reason (as if I had done something wrong or wasn’t good enough) and hit my knees and called out to God and let go of my expectations and turned him over to the Lord. It hasn’t been easy and I have moments of doubt and yes I still cry but I know that God Loves Me, my son and other sons and my husband. He knows exactly what He is doing! Just as he did with Lazarus, Mary and Martha. May God Bless you and your journey. About a year ago, I was really struggling and my best friend suggested we meet for lunch. As I drove to meet her “Fear is a Liar” came on my radio and I just crying; I had no idea why. We had lunch and I was driving home and within minutes of leaving my friend, Fear is a Liar came back on the radio! I again started crying and made a mental note to find out the name of the song and the artist because God obviously had a message for me. The following morning, I get in my car to go to work, turn on the radio and the first song they played was Fear is a Liar. I was so grateful that the DJ said the name of the song and the artist! I kept repeating it to myself and wrote it down the minute I got to my office. I purchased that CD and God is showing me the lies I’ve believed. I need to find the one that makes me not like myself though; all my friends tell me what a sweet, giving, loving person I am but I don’t like myself. I’ll keep listening to Zach Williams CD; hoping God will enlighten me. Good Morning! My past, especially the unsavory part, has been defining my life and robbing me of God’s joy of salvation. The intent of this book is something that I have to pursue diligently and consistently. Thank you for what God has given to you to help His people! I usually read encouragement for today but have never posted any comments ever. Your piece on God is for you really met my spiritual need for the day and week. Thank you for reminding me that I have the holy spirit interceding for me and the devil is always on the attack , studying my every moves ready to take me down. I really want to read your book Enough because I’ve been worn out with leading a group of women whom I didn’t feel I had the “spiritual qualifications” to lead and coupled with my own personal insecurities and lack of confidence I’ve been trying to run way from the tasks by asking for a different group with more “easygoing” women whom I relate better with. However, deep down inside, I do believe if I could rise up to the challenge then I would have let God showcase his power and it would have been a spiritual milestone for me. Needless to say, it has not been easy and now it’s even affecting my health and relationship with some of the women. However, when I read the promises of God in John 14:26 and Romans 8:26-27 the scripture you used in your devotional, it gave me newfound hope I guess it’s the holy Spirit speaking to me through you. I thought God was mad at me. I thought He didn’t love me. First, my daughter died of a brain tumour. Then my husband died in a car crash. I got cancer. Could I really trust a God that would let all this happen. A God who was’t listening to my prayers. I am working on building a loving, trusting relationship with God. I am learning not to compare myself with others. We each have our own story. I am learning that I am enough. Not only has God set a place at the table for me, but I am welcome to sit at that place. I belong there. For now, that has to be enough.